The La Posada hotel in Santa Fe, New Mexico, was once a grand family home. Built in 1882 by Abraham Staab, a Jewish merchant, for his wife, Julia, and their children, it was one of the grandest private structures in the region. The first floor was a public area, the second, living quarters for the Staab family, and the top level a ballroom. Julia’s eighth pregnancy was a difficult one. The son born died a short time after birth. The death plunged Julia into a deep depression, and she spent what was left of life secluded in her bedroom. She died in 1896 at the age of 52. During the 1920s, the property passed out of the Staab family but continued to build its reputation as a resort and destination for travelers. Fast-forward four decades. During the 1970s, a janitor was mopping the floor at the hotel late one night. When he looked up from his bucket, he gasped at the sight of a dark-eyed woman dressed in a long, black gown standing near the fireplace. As he blinked, the woman vanished. This visitation was followed by other mysterious events — glasses that flew off the shelves of the bar, vases of flowers that moved to other locations and other sightings of the mysterious woman in black. The epicenter of the spooky events seemed to be in the second floor suite, once occupied by Julia. Critically acclaimed author Hannah Nordhaus, the great-great-granddaughter of Abraham and Julia Staab, weaves together the strands of Julia’s life in this true-life account, a stunning literary portrait of pioneer life in New Mexico involving ghosts, psychics, imagination and even an improbable love story. Does Julia still haunt the wonderful old hotel? 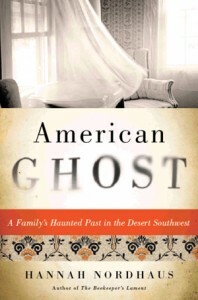 I urge you to read “American Ghost” and decide for yourself.